Welcome, SNHU Alumni & Friends! With a network of more than 112,000 alumni and 130,000 current learners across the globe – not to mention our community partners, families, faculty, staff, and friends – the SNHU community is an incredibly vibrant, diverse, and exciting place to be. Here, you’ll find access to events, SNHU publications and student & alumni stories, and other exciting ways to get engaged – and stay engaged with the SNHU community. 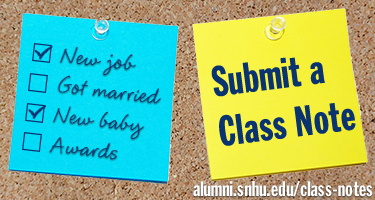 Alumni: upon graduation, you’re automatically a member of the SNHU Alumni Association. This online community is your portal for all of the above, plus exclusive access to the alumni directory and benefits & services. Make sure to keep your alumni profile up-to-date to receive the latest news and opportunities from SNHU. We hope to see you or hear from you soon! New User? Click here to create your account.